Plastic bean hopper with safety locks system. Plastic ground bean container able to hold good quantity of ground coffee. No on-off switch, only it stops according to setting the time in timer. No pulse button for direct brewing into your brewing basket. Sometimes confusing while setting up the upper portion of the grinder. In this case follow the suggestion below, not as difficult as you think. I read reviews from many buyers using this Capresso 565.05 Infinity for more than 2 years and even for 4 years. They claimed it a best grinder and mostly prefer for drip brew or french press. Some other reviews I found critical about this product. They told it lasted only 4 months or broke it etc. They faced the same problems as I mentioned below and got some ways to avoid them or this is not that grinder they want. At last, I want to say Choose your grinder wisely. Don’t go with the wrong one that makes you tell “hell”. Remember that many users are much satisfied with their Capresso infinity. If you wish to have a grinder with all these features for under $150, grab it without any hesitation. Coffee lovers often needs to grind a large amount of coffee. From this point of view you will like this high quality Capresso 565.05 infinity conical burr grinder . You‘ll also find this conical burr for a rare feature for preparing Turkish coffee in its finest setting. And the grind settings- extra fine, fine , coarse and regular offer you consistent grind best suited for your favorite espresso, French press, percolator ,Turkish and excellent for drip coffee. If you are ready to buy this Capresso Infinity, let me know you are going to get the best flavor , less noisy , perfect grinder and fantastic coffee . Yah really a perfect entry level grinder for the money. The latest version has upgraded its feature to be quieter than older version. Also you can find its cosmetic difference that is, its color. Like commercial grinders, Capresso 565.05 is stainless steel finish including 16 grind settings, a timer, coffee container with safety lock system, good ground chamber, quite operation and more. Moreover, you can easily clean this conical burr lifting off its bean container and upper burr. The most important feature of Capresso 565.05 is it has large plastic bean hopper, so you can grind 8 to ½ ounce of beans easily at a time. Best for coffee-drinking gangs, isn’t it? So coffee ground canister can easily holds up to 4 ounces of grounds coffee. Good job! Capresso has 16 settings- so, you get 16 different grind adjustment for four each categories- extra fine, fine, regular and coarse to manage with your favorite Turkish, espresso, French press , percolator and drip brew. The consumers rated this grinder especially for regular grind for drip coffee or french press and their experience is fantastic. though some users’ claim that the grinder works great for espresso, even it grinds so rich to produce creamy espresso, most of them grade this burr grinder for regular drip brew. Timer is another exclusive function in Capresso Infinity. Just turning the timer you can start grinding instantly. Be sure that you set the bean hopper to your chosen setting. Then knob the timer and start your first grinding. Setting the timer at first can be somewhat difficult but not so as you think. The timer has 1-10 dials and which you’ll set? 1 or 2, 5 or 7 or 8 or 10? This is really confusing. Actually i don’t call it timer; it is basically a gauge for how much coffee you want for each cup. Say, if you want 2 shots of espresso, turn the dial to 2. Isn’t it good that you need not be much worried about how much coffee should be per cup? Just set the timer and you need not even stay there!! That grinder will do the rest! What you have to do is to adjust to your beans and save it for next time. so easy. But what you’ll do if all beans are ground and the timer still running? Hah it’s a matter. It won’t stops automatically when the bean container is empty but stops only the dial that set the time. Here I warn you don’t turn the timer backwards. Remember it’s not like a normal timer. If you do it continuously you surely damage it. Check manual that tells you turn the hopper. Yah in this case, when the hopper is empty and the timer is running, twist the hopper counter clock-wise until the grinder stops. Nice solution. Don’t be so tense with this and grind like a champ! Capresso 565.05 Infinity is an excellent quiet grinder you should love. Users always complain any grinder to be much noisy but this Capresso is an exceptional. So quiet it grinds that all users score it high in a word! I found many users wanted to know how to clean it? Will it go fine with soft soap and water?Though some say that it couldn’t be problem with hand wash but you have to dry properly before any grind, I recommend not to do this. As manual discourages to use any liquid or water into the grinder, you better avoid it. Clean upper and lower chamber with brush and use a soft damp cloth to wipe housing and make sure it is dry completely before next use. How frequently you’ll clean depend on your use. If you prefer dark oily beans, you need to clean the chamber more often. Normally all users clean it once a week and once a month give s very good cleaning. Another suggestion is that you can grind raw rice to soak up oils left behind the burr. 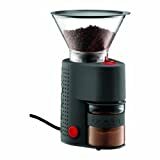 Or try another grinder for some reviewers complain it does not go well with French roast bean. But I think oily bean is a problem for all the grinders. You can try raw rice method if you are habituated with oily beans. To add more, this Capresso 565.05 Infinity conical burr is made in china and it is 120v. 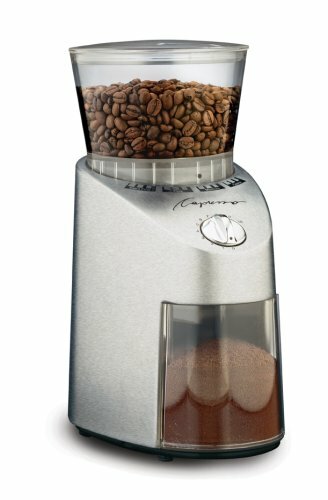 Thankfully Capresso 565.05 Infinity is a high quality burr grinder on the market with a very affordable price. And Amazon can be your great marketplace if you wish any new or used product reached your home as well as also to get your problem solved. Good Luck.